OK so I managed to finish another Christmas card. This one took me awhile to finish. 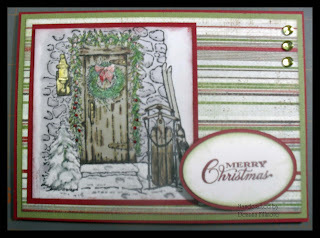 The image stamp is from Stampin Up and the greeting stamp is from Bombshell. I colored the image with prismacolor markers I water color pencils, I then used a clear glaze pen over a few areas. I also used some metallic gold prisma marker on the lamp and door handle. I then added some white fun flock to tree steps & ground. The patterned paper is from fancy pants & the card stock is bazzill saguaro & crimson. ﻿Well that is all for tonight, I will have more to post tomorrow or Saturday. Have a great Friday everyone.